Eat peanuts in moderation to keep your calorie and fat levels under control. 2 How do I Make Chocolate Covered Peanuts? 3 How Many Calories Are in Peanut M&Ms? Although called nuts, peanuts are actually in the legume family along with beans and peas. Planters Dry Roasted Peanuts are made without oil. While they have the same amount of calories as the oil-roasted variety, they have 1 g less total fat, 1 g less saturated fat and a significant amount less sodium, as they are sodium-free compared to 90 mg per serving in the oil-roasted kind. While these peanuts are high in calories and fat, you can still include them in a healthy lifestyle as they have health benefits as well. Planters dry-roasted peanuts contain peanuts and a number of seasonings and additives. They are flavored with salt, sugar, paprika, onion powder, garlic powder and include additives such as monosodium glutamate (MSG) for flavor and gelatin. 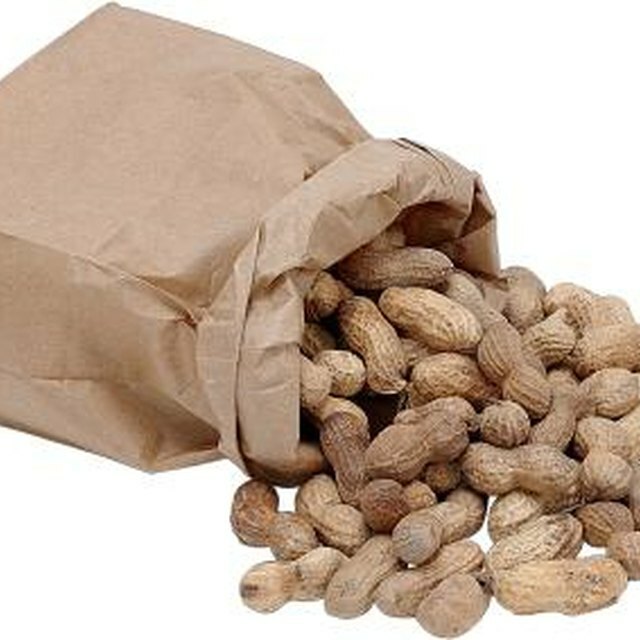 If you want peanuts with no additives, choose plain peanuts in the shell. A 1-oz. 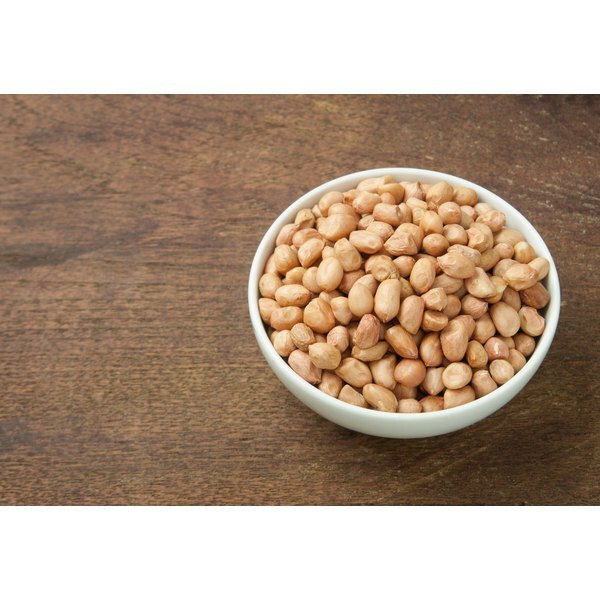 serving of Planters dry roasted peanuts contains 170 calories, 22 percent daily value of fat and 10 percent DV of saturated fat, according to the Planters website. Part of the fat content in these peanuts encompasses heart-healthy and “bad” cholesterol-lowering polyunsaturated and monounsaturated fats, so it is not completely a negative factor. Due to the high fat and calorie content, you should eat this is a food in moderation. In terms of the other macronutrients, this serving size contains 2 percent DV of carbohydrates, 7 g of protein and 8 percent DV of fiber. The percent daily values are based on a 2,000-calorie diet for healthy adults, according to MayoClinic.com. In terms of micronutrients, peanuts are full of vitamins and minerals. A 1-oz. serving contains 5 percent DV potassium, 4 percent DV iron and 10 percent DV each of vitamin E, folate, phosphorus and copper, according to the Planters website. The same 1-oz. serving contains 15 percent magnesium, 20 percent niacin, 30 percent manganese and small amounts of many others micronutrients. According to the Planters website, 1.5 million Americans have peanuts allergies. Those who are allergic to peanuts can experience a wide range of symptoms from mild to severe. Mild symptoms include a skin rash or digestive problems. On the severe side, a peanut allergy can lead to anaphylaxis, which can be fatal without treatment. Since a peanut allergy is a life-long allergy, it’s important to know if you have it and stay away from peanuts if you do.